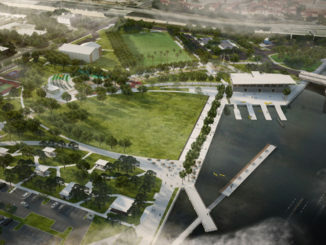 Aitken Place Park is a 3,000m2 urban park currently being developed within the East Bayfront’s Bayside development – a formerly underutilized industrial area which is being transformed into an active and vibrant mixed use community as part of Waterfront Toronto’s ongoing revitalization efforts. Aitken Place Park provides a key link in the network of public spaces that connect Bayside, including the Water’s Edge Promenade, Canada’s Sugar Beach and the active play features of Sherbourne Common – all opened by Waterfront Toronto in 2010. Designed to complement these existing open spaces, Aitken Place Park provides an intimate waterfront retreat and neighbourhood connection that invites local residents, tourists, and visitors to enjoy the Lake and nature year round. 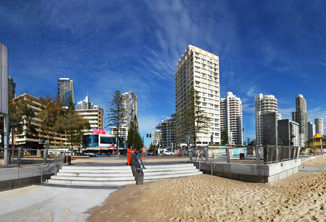 The park design includes interactive elements for people of all ages, and is designed with all seasons in mind. The south entrance welcomes people to an urban porch – a multi-purpose plaza with which offers Wifi and a variety of seating options including movable furniture, swivel seating, and a seating wall. North of the plaza, the park slopes gently upwards to an elevated knoll that provides a place to sunbathe in the summer, sled in the winter, and enjoy views of the lake and the surrounding neighbourhood from a raised vantage point. A pavilion at the top of the knoll provides additional opportunities for overlooking Lake Ontario, sheltered from sun and wind. Its corten steel cladding commemorates the Bayside area’s industrial history, and the roof alludes to the grid orientation of the plan for the Village of York by Alexander Aitken, after whom the park is named, while the wood floor references East Bayfront’s current grid orientation. An urban dog park at the north end further complements the open space amenities in the area. As dog walkers will be using the park early in the morning and late in the evening, the park is designed for extended user hours. A zigzag path along the length of the park not only creates a strong aerial view appeal, but also provides an accessible way to travel from the top to the bottom of the knoll. A water rill following alongside the path provides a tactile waterplay opportunity and the soothing aural texture of trickling water. Tall grasses, ground cover, shrubs and trees at the sides and edges of the park create a natural retreat from the urban surroundings. 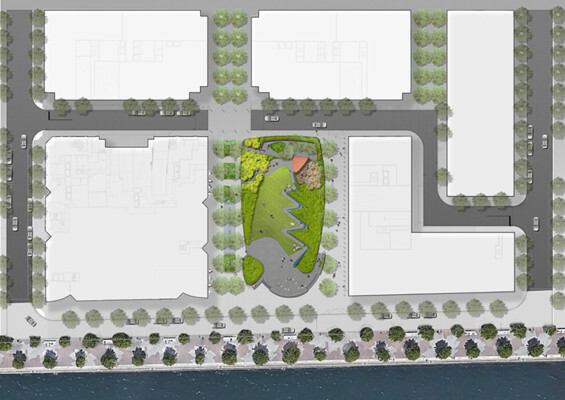 A tree covered garden promenade along the western edge of the park offers children’s play equipment and multi-use seating and spaces to work or eat while enjoying views all the way from Queens Quay to Lake Ontario. 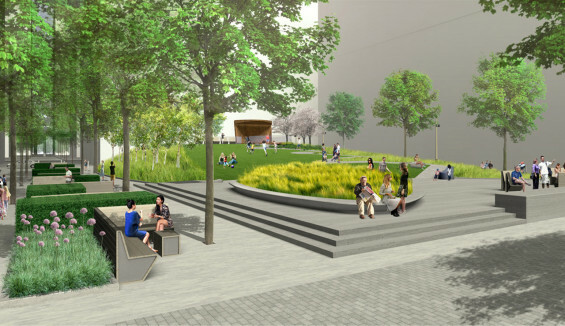 In keeping with the Waterfront Toronto’s Sustainability Framework, Aitken Place Park will embrace and utilize key sustainability principles, building techniques and technologies, including biodiversity, bio-retention, storm water retention, low energy lighting, and a tree canopy covering a large portion of the park. Soil excavated from the site was reused for to create the knoll, and water from the rill will be reused for irrigation. 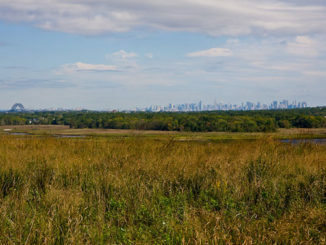 Native species plantings reduce maintenance requirements, support environmental stewardship, and ensure that this park thrives over the long term. Designers | Thomas Balsley Associates + Scott Torrance Landscape Architect Inc.
Soil-Mat Engineers and Consultants Ltd.